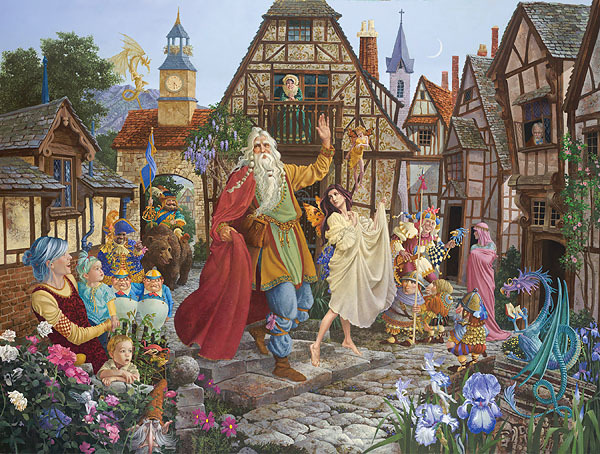 The beloved Storyteller from James C. Christensen’s 1999 Greenwich Workshop limited edition print Once Upon a Time returns in this fanciful new image commissioned for the 20th Anniversary of the Timpanogos Storytelling Festival. Twenty years have passed since that magical meeting in the forest and the Storyteller is out and about on his circuit. Scores of characters are coming into town to greet him including some familiar Christensen dwarves, dragons, faeries and characters like the oddball twins Tweedle Dee and Tweedle Dum. Four well-known Timpanogos storytellers make costumed appearances. Can you find the two homage-to-fantasy-artist-Brian Froud characters? Even Mount Timpanogos peeks over the Tudor-inspired buildings to welcome back the Storyteller.